Welcome to our Ischia blog, Good Morning Ischia! Here you can see the entry for Monday 25th November 2013. The new week begins with a new type of weather. Gone are the clouds, rain and heavy winds (although the latter may re-surface later), leaving bright sunshine on a beautiful, crisp, late-autumnal morning. There has been a significant downward shift in the temperatures over the last few days, meaning the thicker parts of yesterday's incredible snowfall lingered into the evening before eventually melting away. Today's predictions are for a maximum of 14° celcius (57° fahrenheit) and for a very chilly minimum of just 6° celcius (44° fahrenheit). The photo I've chosen for today is of one of the fountains at the wonderful La Mortella Gardens in Forio. 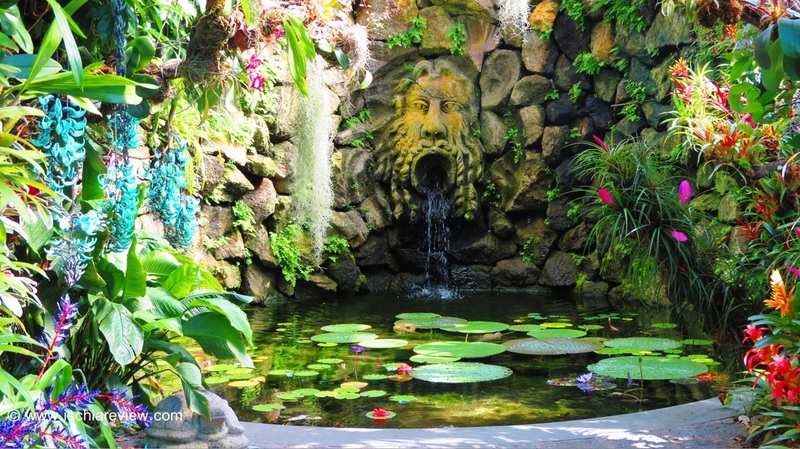 The gardens are a major part of what is now called The Sir William Walton Foundation, named after the British composer who set up home in Ischia with his Argentinian wife Susana back in the 1950's. The glamorous couple formed a dynamic creative partnership, Sir William was know throughout the world for his musical compositions while Lady Susana's main passion was for the garden and it is mainly down to her hard work that we are able to enjoy the splendour of La Mortella (the myrtle in English) how it is today. With lots of land around their home, the couple decided to call in a landscape architect to help them create the right environment for Susana's botanical skills to thrive. The gardens have been open to the public since 1991 but represent more than 50 years of passionate work and devotion to creating a special paradise on the couple's doorstep. The garden with its incredible array of colours and exotic plant specimens is undoubtedly the star of the show for anybody spending a day walking around the foundation's premises but not the only attraction. The beautiful villa which is at the heart of the garden is also open to the public and offers a fascinating insight into how the couple used to live with lots of reminders of Sir William's musical career from the grand piano to musical scores that he wrote while his wife was busy perfecting the garden. During the spring and summer the Sir William Walton Foundation stage classical music concerts at their outdoor Greek theatre with a heavy emphasis on showcasing and nurturing young talent in the form of their Festival of Youth Orchestras. The combination of the classical music with the dramatic backdrop of the botanical garden make these events truly unique and an experience not to be missed for visitors to the island. Sadly the couple have both now passed away, Sir William Walton died in 1983, while Lady Susana lived on for a further 27 years before her death just a few years ago in 2010, but their memory lives on in the form of the foundation and their wonderful home which can be shared and enjoyed by anyone with an interest in nature, culture and the musical arts. For more information about The Sir William Walton Foundation click here to be re-directed to their website (English version), or drop us a line of you'd like to ask us any questions about it. Ok that's all for today, have a great start to the week wherever you are and we'll be back with more from Ischia tomorrow morning.